Math comes down to simple problem solving; and training one’s brain to be able to think through a variety of situations and get to the right answer or come to a conclusion. Math, to me, means essentially fostering a sense of determination and commitment to finish something you’ve started. Because math goes beyond just learning numbers, functions, and concepts, I try to give Sophia and Olivia opportunities to learn math through a variety of methods: traditional/book learning, singing, learning tools, games, and real-life application. The girls learn core math concepts and facts by using their math books. I use Rod & Staff books since both girls say they like them. 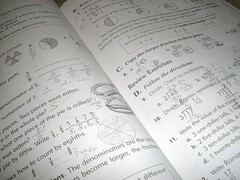 At the last homeschool conference I attended, I looked at a variety of math books. Some had a lot of color and impressive graphic design; some used the computer; and others used DVDs to teach math. After looking at the variety of resources, I decided to stick with Rod & Staff. Rod & Staff isn’t fancy – the text and images are all in black and white. However, the majority of examples they use all tie into agriculture, farm animals, and cooking/baking – all things that are quite applicable to the girls’ life right now. Sophia’s fourth grade math book. There seems to be a lot of repetition with some of the fundamental concepts and facts (e.g., addition and subtraction facts, skip counting by 2s/5s/10s, multiplication and division facts). However, knowing these facts by memory is critical to forthcoming math skills, so I think that’s valuable. That being said, once the girls have “mastered” a skill, I don’t make them continue doing pages of the same thing. They can move onto the next skill. 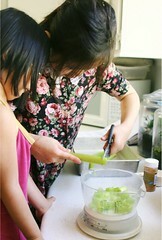 That’s one of the benefits of homeschooling – adapting the lessons to the each child’s skills and knowledge. some of the math problems she’s doing. 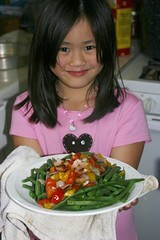 For this lesson, she chose to use shells. The girls both enjoying singing and seem to retain information much better when they learn it by listening to and singing songs. Some of the CDs that the girls use for math. 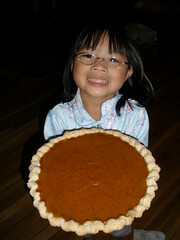 – Shiller Math Songs – this was a CD that Olivia used a couple of years ago when using the Shiller math curriculum. There are a variety of songs that had her moving about while listening to instructions on the CD. – Addition Songs by Kathy Troxel – this CD comes with a songbook/workbook, and has helped Olivia learn counting from 1 to 20 as well as all the addition facts from 1+1 to 9+9. There are sing-along songs as well as echo-style songs for self-testing. – Multiplication Songs by Kathy Troxel – this CD also comes with a songbook/workbook, and has helped Sophia learn all the multiplication tables 2 through 12. 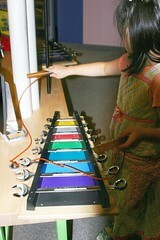 There are sing-along songs as well as echo-style songs for self-testing. – One Hundred Sheep by Roger Nichols – There are nine songs on this CD that teach counting by 2s, 3s, 4s, 5s, etc. This skill is known as “skip counting” and is used in every math process from multiplication to algebra. The songs use stories from the Gospels as a basis for the lyrics. Both the girls use this CD. Olivia playing with some of the math dice. One of the ways to learn and/or review the basic facts is by using dice. using three different types of dice. – Blue dice with the numbers 1-6 on them. – Green dice with the numbers 7-12 on them. – White dice with different symbols (e.g., plus, minus, times, divided by). – Yellow dice with Roman numbers. – Big red and orange dice with little white dice inside it. Both the dice have the traditional 1-6 dots on each side. A variety of dice to use with math games. Learning Resources has a Minute Math Electronic Flash Cards in which the girls are presented with different facts (e.g., 2+9, 8×7) and need to type in the answer. The “game” is based on speed and accuracy. There is a voice that tells the player if she typed in the correct answer. 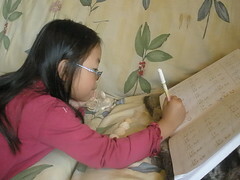 Sophia testing herself on multiplication facts. Sophia likes this “game,” but Olivia finds it frustrating. So, when Sophia needs/wants to do something different for math, she’ll use the Electronic Flash Cards. 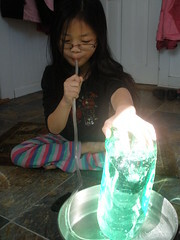 Both the girls learn best when there is a hands-on component to the lesson. 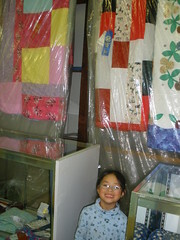 One of the things that I found at the last homeschool conference was a set of Learning Wrap-Ups. Each Wrap-Up focuses on a different process (e.g., addition, subtraction, multiplication, division). Olivia testing herself on addition facts. To use them, the girls start with the first number on the left side and add/multiply it by the number in the middle of the key. 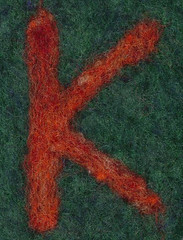 Then they find the answer on the right hand side and bring the yarn to the other side and wrap it around the backside before bringing it to the second number on the left side. They repeat the process until all the numbers and answers have been wrapped. 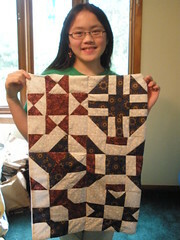 Olivia with the finished Wrap-Up. so she got all the answers correct. The Wrap-Up is self-checking on the back. 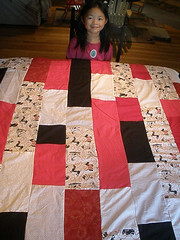 The key has a raised pattern to show where the yarn should be. If the yarn matches the pattern, then all of the answers were done correctly. 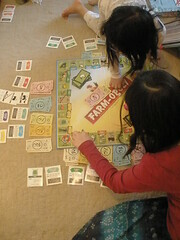 The girls have many games that they enjoy playing that have a math component to them: Horse-opoly, Life, and Farm-opoly. In addition to purchased games, we’ve also made our own math games. 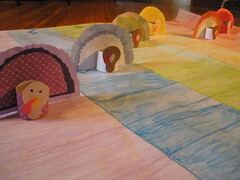 For Thanksgiving, we made a turkey racing game (see below) that involved counting and probability. 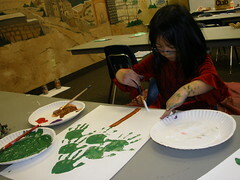 The girls had fun making and playing the game, and having it be a part of Thanksgiving activities in the future. Bringing math into everyday activities provides the girls with a learning experience in a real-life setting, and helps enhance comprehension of what they are learning. by 5s and 10s using buttons. 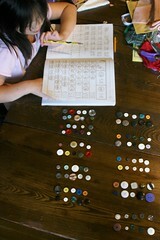 An early math skill is sorting, although it is one that people use in their daily lives. 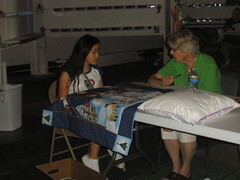 One of the ways that sorting was incorporated into homeschooling is through stamp collecting. The girls each have their own books for stamps, and have enjoyed sorting them into categories (e.g., horses, flowers, pandas, wild animals). 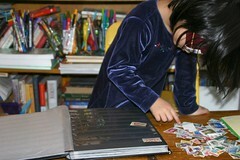 Olivia sorting through stamps when she was very young. She still has and adds to her stamp collection. Another way that the girls have used math is when they have sorted items to donate. 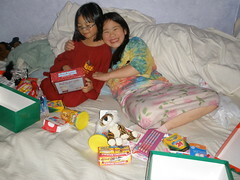 Each year we do Operation Christmas Child. 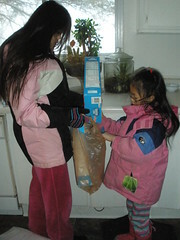 The girls enjoy choosing items to put in the boxes, and then dividing and sorting them at home. The girls sorting items for Operation Christmas Child boxes. 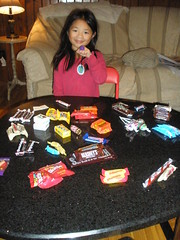 Of course, each October the girls look forward to sorting candy they get when they go out for Halloween. They will compare what each one got, and often will trade candy. Olivia with candy she sorted. Math also is used when studying science. 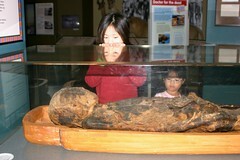 Sophia measuring the length of a bone. One of the easiest ways to tie the two subjects together has been when we have been able to measure something tangible (e.g., feathers, depth of a woodpecker hole in a tree, the circumference of a tree, the length of a bone). 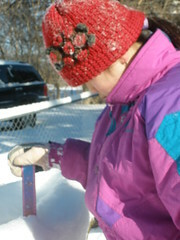 Sophia measuring the snow depth. 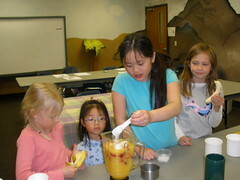 The girls enjoy cooking and baking. 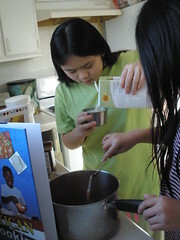 Reading a recipe and then measuring the ingredients is something that I have involved them in well before they were doing their math books. to make a fruit smoothie. 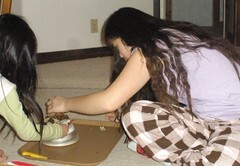 I’ve had a food scale for many years, and it seems like in the past few years that it has been used more frequently by the girls – whether they are making food in the kitchen or weighing an item for a science lesson. Money is something that the girls have enjoyed learning about in math. Rather than just using pictures in math books, the girls receive a bit of money for doing some chores. 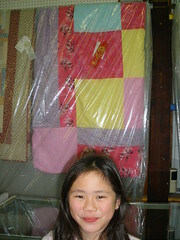 They also receive money periodically as gifts from grandparents and relatives. Originally, I had the girls set up save-spend-give jars and a percentage of each amount they earned or was gifted was divided into the three jars in a 50-40-10 percent ratio (respectively). Now, I have them do a 50-50 split – save half/spend half. Of the spending money, some they use as donation money. 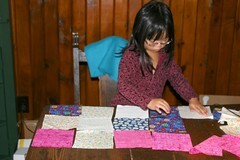 The girls have their own wallets with money and gift cards, and have learned to interact with cashiers; and vendors at craft shows and farmer’s markets. They have to learn to use only the money they have available (no loans or borrowing money). 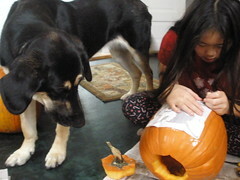 This has taught them the value of budgeting and patience (especially if they need to save for a larger item). 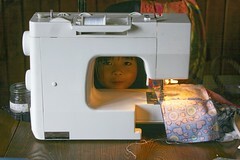 I’m hoping that they carry this into their adult life and save half of what they earn. 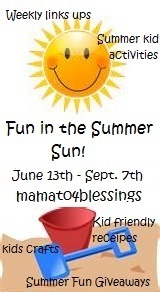 Ideas for Kid-Friendly Summer Activities + Link Up Your Kid-Friendly Summer Activities! 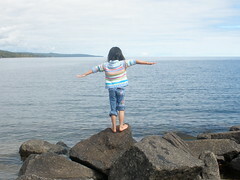 This week, the girls and I did some fun activities as a kick-off to summer. Since we homeschool year-round, many of these activities tie into different academic subjects – like math, science, health, physical education, and reading. Before we get started with any outdoor activities, I wanted to make a Summer Activity Bag that would have things that would make our time outside more enjoyable. 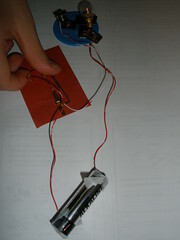 The idea came from a past issue of Family Circle. I picked a bag that we weren’t using. 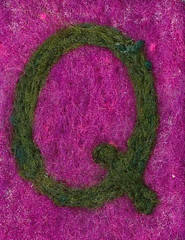 It’s one that I got from a craft fair several years ago; and it’s made from a felted sweater (a great way to reuse). – ice-cream or special treat money. The broom and baby powder are great for getting sand off feet and bodies. By putting together these bags, we can simply grab them on our way out the door and have everything we need for spur-of-the-moment fun. Jar to collect change during the summer. 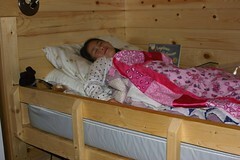 The July/August 2007 issue of Country Home had a picture of a hideaway in a forest of pine trees. As you can see from the picture, red and white fabric was hung between the trees, and the ground had a variety of red and white throw rugs. 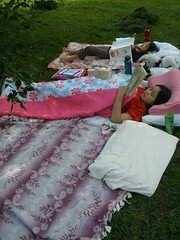 There were pillows, low chairs, and a table with a picnic set atop. The girls thought this looked like such a fun idea, and they wanted to make something like that here. The pine trees in the backyard have boughs that almost touch the ground. So, we decided to use the arbor instead since it isn’t being used for anything else. would make a good fort/retreat. stays in the right area. As much as I would have liked to go to the fabric store and purchase nicely-coordinated fabrics and curtain clips, I thought a more important lesson for the girls was to learn to make do and be resourceful with what you have on hand. 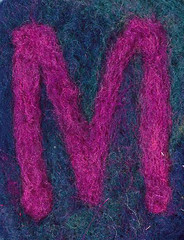 So, I went through my fabric and found some rather large pieces – all in the blue/green/purple color range. Rather than using clothesline that we didn’t have on hand, we used twine since that was an item that we had a surplus of (thanks to bales of hay). With a large piece of soft flannel, I made four pillows for the girls stuffed with wool from sheep I raised many years ago. 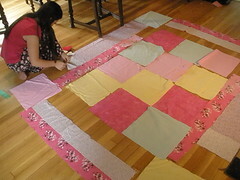 With the leftover fabric, I made a matching ground cloth/tablecloth for picnics, reading, or relaxing outside. as soon as I brought it out. I put them in a bin that can be left outdoors. This will protect them from the rain and sun. Of course, once we had the hideaway set up, we had to do something fun…like have a an ice cream treat on an 82 degree evening. When it’s cooler outside, the girls thought of some other things we could do in the hideaway: have a picnic, play a game of cards, or read a story. that we put up in the backyard. Although there is pre-packaged hummingbird food (which I choose to use at least for a few times at the beginning of the season), you also can make your own by stirring 1 part of white cane sugar into 4 parts of water. 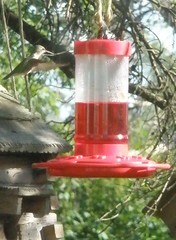 If the hummingbird feeder has red on it, there’s no need to add red dye to the water-sugar mixture. My parents use to coordinate “Mystery Trips” with a senior group to which they belonged. About a month before the Mystery Trip, they would go on a drive to explore different sites that they thought the seniors would enjoy. “A Mystery Trip? What’s a Mystery Trip?” Olivia asked. “That sounds like fun! Do I need to bring my swimsuit?” she asked. And so began the many questions from the girls: Have I been there before? Is it far away? What should I wear? Do I need to bring some money? And so on. The first stop was at a bakery that we use to go to periodically. It reminded me of times when I was growing up and taking a walk to the bakery a few blocks away on a Saturday morning. It was always such a treat to pick out something special for breakfast. First stop on the Mystery Trip: the bakery. The girls enjoyed a treat for breakfast. After that, we did a few errands (living 14 miles away from the closest town makes it necessary to group errands and activities together). Then, we began driving on a road that we normally don’t go on. “Where are we going?” Olivia asked. “To the next surprise,” I answered. “Maybe…maybe not. And, yes, you went here many years ago,” I said. They had no idea where they were going. Even pulling into the Wildlife Science Center for their annual Canine Carnvial didn’t immediately bring back any memories since the girls were only about 3 and 5 years old at the time (they are 8 and 10 years old now). By the time we walked in, however, parts of the previous visit did come back to them. “Oh! I remember this!” Sophia said. including this wolf as well as a black bear, and mountain lion. However, it was what they saw at this visit that interested them even more: a spotted skunk (who was descented), a fox, gopher snakes, wolves, wolf pup, coyotes, bear cubs, red-tailed hawk, and screech owl. and the animals watched them closely as well. They enjoyed watching the Minnesota Search and Rescue’s dogs go through an obstacle course; and met one of the dogs named Olive. Olivia picked Olive’s information card (kind of like a baseball trading card), and thought she recognized her as one of the dogs at the event. She asked the handler if his dog was Olive. Sure enough, she was Olive. Needless to say, Olivia was very happy to be able to pet the dog on her trading card. The girls learned some new facts about wolves. One they they learned was that wolves are inefficient hunters (thus, being part of a group is a good thing, even though they have to share their food). On the average, a wolf catches only 6 in 100 deer. Not a high success rate. Five week old wolf pup at the Wildlife Science Center. looked like it had incredibly sharp teeth. 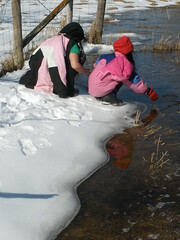 The girls both had a lot of fun, and got to see some wild animals they normally wouldn’t encounter on a daily basis. It was interesting to see the screech owl and red-tailed hawk at such a close distance. Normally we see them flying overhead or perched somewhere. So, to be able to see the patterns and colors of the feathers; to have the owl follow the girls as they moved slowly around it, and to see their size up close rather than seeing them in the distance or in a picture in a book…it was a real treat for us all. It weighs about as much as a stick of butter. Doing a monthly “Mystery Trip” to some place within a 50 mile radius of home would be fun to do. Next time I’m going to add a few more surprise destinations within the trip and stretch it out a bit more. This week – during the break between the thunderstorms, heavy rain, and hail plus a tornado less than 10 minutes from here – we were able to do the Outdoor Hour Challenge Spring Series #4: Wildflowers-Dandelions. Before heading outside, I read pages 531-535 in the Handbook of Nature Study about dandelions. In this way, I could point out different things about dandelions as the girls were looking at them. – The taproot, which lacked only an inch of being a foot in length. It was smooth, whitish, and fleshy, and, when cut, bled a milky juice; it was as strong from the endpull as a whipcord; it also had a bunch of rather fine rootlets about an inch below the surface of the soil. – Dandelion leaves [have] edges [that] are notched in a peculiar way, so that the lobes were, by some one, supposed to look like lions’ teeth in profile; thus the plant was called in France “dents-de-lion” (teeth of the lion), and we have made from this the name dandelion. – The leaves are bitter, and grazing animals do not like to eat them. – The hollow stalk…may be made into a trombone [by children]. [This is a good] lesson in the physics of sound, since by varying the length the pitch is varied. – If the plant is in the lawn, the stem is short….It will blossom and seed within two inches of the ground; but if the plant is in a meadow or in other high grass, the stalk lifts up sometimes two feet or more. Dandelion stems can grow to be up to two feet tall. This one was over one foot tall. – Before a dandelion head opens, the stem, unless very short, is likely to bend down, but the night before it is to bloom it straightens up; after the blossoms have matured it may again bend over, but straightens up when the seeds are to be cast off. – It often requires an hour for a dandelion head to open in the morning and it rarely stays open longer than five or six hours; it may require another hour to close. Unopened dandelion in the morning. near the stem where they make a frill. – The involucral bracts, in the row set next to the flowers, are sufficiently long to cover the unopened flowers; the bracts near the stem are shorter and curl back, making a frill. – In the freshly opened flower-head, the buds at the middle all curve slightly toward the center, each bud showing a blunt, five-lobed tip which looks like the tips of five fingers held tightly together. Dandelion in the process of opening. – All the flowers in the dandelion head have banners, but those at the center…have shorter and darker yellow corollas. – On dark, rainy days and during the night the little green house puts up its shutters around the flower family. – [Dandelions] awaken long after the sun is up in the morning; they often do not open until eight o’clock. – After all the florets of a dandelion head have blossomed, they may stay in retirement for several days, and during this period the flowerstalk often grows industriously; and when the shutters of the little green house are again let down, what a different appearance has the dandelion head! The akenes with their balloons are set so as to make an exquisite, filmy globe. Dandelion akenes make a silver globe. – The balloon is attached to the top of the beak as an umbrella frame is attached to the handle, except that the “ribs” are many and fluffy. Four akenes on my shoe. – This blossom-bald head after all the akenes are gone…is like a mosaic, with a pit at the center of each figure where the akene was attached. Dandelion head minus the akenes. – Before the akenes are fully out this soon-to-be-bald head is concave at the center; later it becomes convex, and the mechanism of this movement liberates the akenes which are embedded in it. Akenes ready to fly off. – Each freshly opened corolla-tube is full to overflowing with nectar, and much pollen is developed; therefore the dandelion has many kinds of insect visitors. ~~> It…fourishes on all sorts of soils. ~~> It thrusts its long taproots down into the soil, and thus gets moisture and food not reached by other plants. ~~> Its leaves spread out from thebase, and crowd and shade many neighboring plants out of existence. ~~> It develops almost numberless akenes, and the wind scatters them far and wide and they thus take possession of new territory. ~~> Many insects visit it, and so it has plenty of pollen carriers to insure strong seeds. Hand covered in pollen from picking dandelions. Spend 15 minutes outdoors this week in your own backyard or a near-by park. As you walk along, keep your eyes out for dandelions. See if you can find several dandelions in various stages of growth. This was easy to do since we have so many dandelions growing in the yard. During the mid-day we observed various stages of growth. In the late-afternoon, we could see the dandelions in various stages of opening-to-closing. Dandelions in various stages of growth. Look at the leaves and collect a few for sketching later in your nature journal. We will be doing an entry in our nature journals this week. If it is growing in your own yard, you might like to dig up the complete dandelion plant and observe the roots. Didn’t have a chance to do this, but will do at a later date. Measure the height of several different dandelion plants and compare them. This was something that the girls enjoyed. Their idea was to do a race to find the longest stem. bring them back to measure. 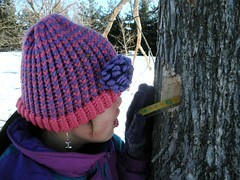 For the first round, Olivia found one with a 6″ stem and Sophia’s was 5 1/2″. 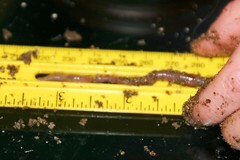 The second round, Sophia found one with an 11 1/2″ stem and Olivia found one with a 10″ stem. As noted above, dandelions can grow to be over two feet tall. The girls wanted to see how tall this would be, so they put two rulers together. Imagine a dandelion growing this tall! Some of them do in meadows or where there is high grass. Examine an unopened dandelion flower. Sophia opening an unopened dandelion. Watch a bee working in a dandelion. We did not see any bees visiting the dandelions while we were outside. Observe the seeds and how they are dispersed. See pictures at the top of the post for the akenes on the dandelion as well as stuck to my shoe. The girls both could see how they resembled umbrellas. They also are similar to spiderlings in that they use the wind to find a new location in which to grow. Observe your dandelions on a sunny day and then on a cloudy day. Note any differences. We will do this over the weekend since another round of storms are forecasted to arrive on Friday. Take some time to draw the dandelion in your nature journal. Make sure to record your observations of the dandelion and make a sketch of the leaf and flower. We ran out of time the afternoon when we did the study, so the girls still will need to do a journal page. 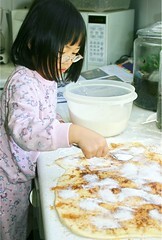 We made Dandelion Flower Cookies. 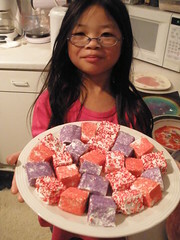 The recipe is from The Splendid Table (on National Public Radio). Note: Before making the cookies, read Dr. Peter Gail’s instructions for cooking with dandelion flowers (below the recipe). The cookies are moist and taste have a pleasant, though not strong flavor. The strongest flavor came from the vanilla, not from the dandelions. The tiny yellow petals make the cookies pretty and unusual…certainly something that children will remember…hopefully in a good way. Preheat oven to 375°F. Blend oil and honey and beat in the two eggs and vanilla. Stir in flour, oatmeal and dandelion flowers. Drop the batter by teaspoonfuls onto a lightly oiled cookie sheet and bake for 10-15 minutes. Dandelion flowers aren’t just pretty. They are also extremely nutritious food and have none of the bitterness of dandelion leaves if you cut off the green bracts at the base of the flower cluster. Measure the required quantity of intact flowers into a measuring cup. Hold flowers by the tip with the fingers of one hand and pinch the green flower base very hard with the other, releasing the yellow florets from their attachment. Shake the yellow flowers into a bowl. Flowers are now ready to be incorporated into recipes. 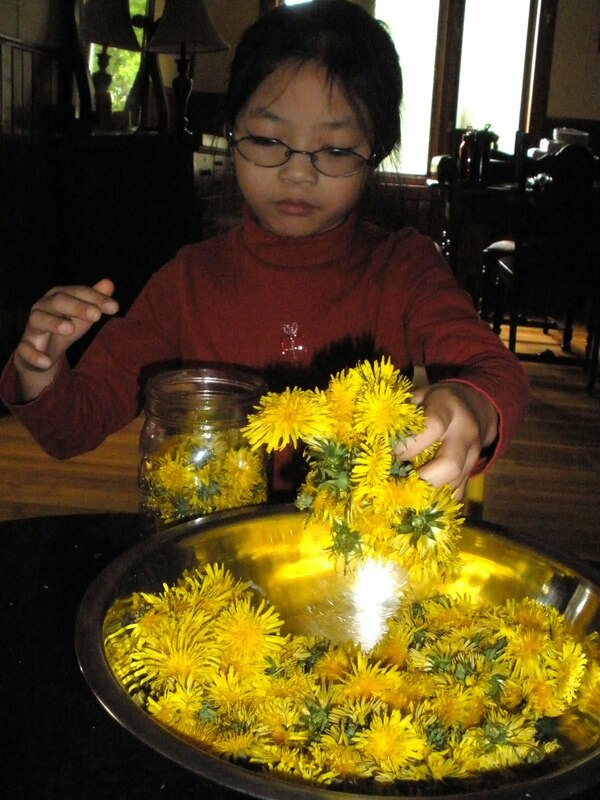 I found a few more uses for dandelions which we started to work on: dandelion vinegar and dandelion-infused oil (which also can be made into a salve). 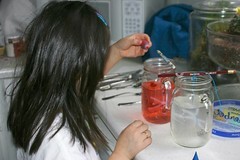 The first step for both the vinegar and oil/salve is to collect the blossoms. Make sure they are from an area that isn’t sprayed with chemicals. These dandelions came from our yard which is not sprayed. Fill a quart jar with blossoms. 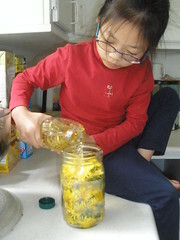 Olivia filling a jar with dandelion blossoms. For the dandelion vinegar, cover with apple cider vinegar and then put a cover on the jar. Place in a sunny location to steep. Shake well every day. After two weeks, strain with a cheesecloth. The dandelion vinegar should be stored in the refrigerator and used on salads. For the dandelion-infused oil, pour oil (olive, almond, or canola) over the blossoms until they are fully covered. Poke around with a wooden spoon handle to make sure there are no air bubbles. Cover with a coffee filter held on by a rubber band (or a lid if you’re concerned about the jar being tipped over for some reason). Olivia pouring oil over dandelion blossoms. Place in a sunny location to steep for two weeks. Stir the mixture once a day. 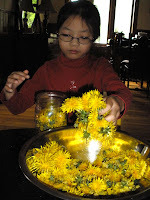 After one week, strain the mixture, throw out the brown dandelions, and add fresh ones. Cover with the coffee filter/lid and return to a sunny location for another week of steeping. 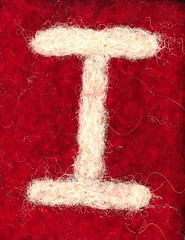 After two weeks, strain using a cheesecloth. 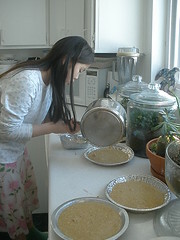 We haven’t gotten this far yet, but to make the dandelion salve, make the dandelion-infused oil first. 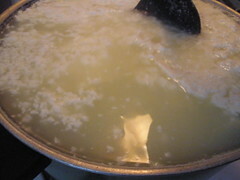 Then add grated beeswax to the oil and melt it. Add enough to reach your desired consistency. 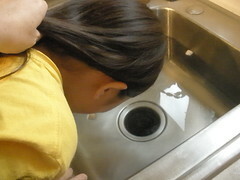 To test the consistency, drip a drop of the mixture onto a plate. It will cool immediately and you can see if it is thick enough. Dandelions have pain-relieving properties, so the oil and salve can be used for sore muscles or arthritis. Just apply to the affected area. It can also be used to relieve sinus headaches by rubbing a little on your forehead. The salve and oil can be used for dry skin as well. As soon as the dandelion vinegar, oil, and salve are done, I’ll post pictures. There are two more recipes that we want to make, but didn’t have enough time today: dandelion jelly and dandelion fritters. 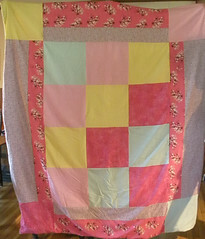 We’ll be making these items this week since there seems to be no shortage of dandelions in the yard. The last thing we did as part of today’s study on dandelions was focused on storytelling and poetry. I read to the girls the story about how you can’t pick a dandelion. It’s a lovely story and gives a very different view of what a dandelion is…as is anything in nature.